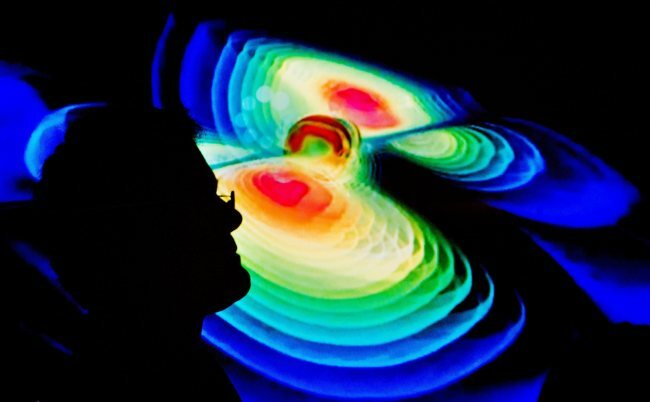 WASHINGTON (AFP) - In a landmark discovery for physics and astronomy, scientists said Thursday they have glimpsed the first direct evidence of gravitational waves, ripples in the fabric of space-time that Albert Einstein predicted a century ago. When two black holes collided some 1.3 billion years ago, the joining of those two great masses sent forth a wobble that hurtled through space and reached Earth on September 14, 2015, when it was picked up by sophisticated instruments, researchers announced. "Up until now we have been deaf to gravitational waves, but today, we are able to hear them," said David Reitze, executive director of the LIGO Laboratory, at a packed press conference in the US capital. Reitze and colleagues compared the magnitude of the discovery to Galileo's use of the telescope four centuries ago to open the era of modern astronomy. "I think we are doing something equally important here today. I think we are opening a window on the universe," Reitze said. The phenomenon was observed by two US-based underground detectors, designed to pick up tiny vibrations from passing gravitational waves, a project known as the Laser Interferometer Gravitational-wave Observatory, or LIGO. It took scientists months to verify their data and put it through a process of peer-review before announcing it on Thursday, marking the culmination of decades of efforts by teams around the world including some 1,000 scientists from 16 countries, according to the National Science Foundation, which funded the research. Gravitational waves are a measure of strain in space, an effect of the motion of large masses that stretches the fabric of space-time -- a way of viewing space and time as a single, interweaved continuum. They travel at the speed of light and cannot be stopped or blocked by anything. As part of his theory of general relativity, Einstein said space-time could be compared to a net, bowing under the weight of an object. When objects with mass accelerate, such as when two black holes spiral towards each other, they send gravitational waves out around them at the speed of light, like ripples emanating from a pebble thrown in a pond. The strongest waves are caused by the most cataclysmic processes known to mankind -- black holes coalescing, massive stars exploding, or the very birth of the Universe some 13.8 billion years ago. While scientists have previously been able to calculate gravitational waves, they had never before seen one directly. According to the Massachusetts Institute of Technology's (MIT) David Shoemaker, the leader of the Advanced LIGO team, it looked just like physicists thought it would. "The waveform that we can calculate based on Einstein's theory of 1916 matches exactly what we observed in 2015," Shoemaker told AFP. "It looked like a chirp, it looked at something that started at low frequencies -- for us low frequencies means 20 or 30 hertz, that's like the lowest note on a bass guitar, sweeping very rapidly up over just a fraction of a second... up to 150 hertz or so, sort of near middle C on a piano." The chirp "corresponded to the orbit of these two black holes getting smaller and smaller, and the speed of the two objects going faster and faster until the two became a single object," he explained. "And then right at the end of this waveform, we see the wobbling of the final black hole as if it were made of jelly as it settled into a static state." -- were conceived and built by researchers at MIT and Caltech. One is located in Hanford, Washington, and the other is in Livingston, Louisiana. A third advanced detector, called VIRGO, is scheduled to open in Italy later this year. Others are planned for Japan and India in the coming years. Tuck Stebbins, head of the gravitational astrophysics laboratory at NASA's Goddard Spaceflight Center, described the LIGO detector as the "one of the most complex machines built by humans." Physicists said the gravitational wave detected at 1651 GMT on September 14 originated in the last fraction of a second before the fusion of two black holes somewhere in the southern sky, though they can't say precisely where. 1.3 billion years ago, and their mass was 29-36 times greater than the Sun. The wave arrived first at the Louisiana detector, then at the Washington instrument 7.1 milliseconds later. The two instruments are 1,800 miles (3,000 kilometers) apart, and since both made the same reading, scientists consider their discovery confirmed. Accolades poured in from across the science world, as experts hailed a discovery that will help better understand the universe. "This is one of the major moments in astronomy. It's completely transformational," said Alberto Vecchio, professor of astrophysics at the University of Birmingham's School of Physics and Astronomy. "This expands hugely the way we can observe the cosmos, and the kinds of physics and astrophysics we can do," said professor Sheila Rowan, Director of the University of Glasgow's Institute for Gravitational Research. Abhay Ashtekar, director of the Institute for Gravitation and the Cosmos at Penn State University, described the discovery as "breathtaking" and said it "will stand out among the major achievements of 21st-century science." Andrew Coates, professor of physics at University College London, said it was "up there with the Higgs boson, the mass of the neutrino, discovery of the electron, electromagnetism, the Copernican revolution and Newton's laws." "We can now listen to the universe rather than just look at it," said professor B S Sathyaprakash of Cardiff University. "This window turns on the soundtrack for the universe." Indirect proof of gravitational waves was found in 1974 through the study of a pulsar and a neutron star. Scientists Russell Hulse and Joseph Taylor won the Nobel Prize for physics for that work in 1993.